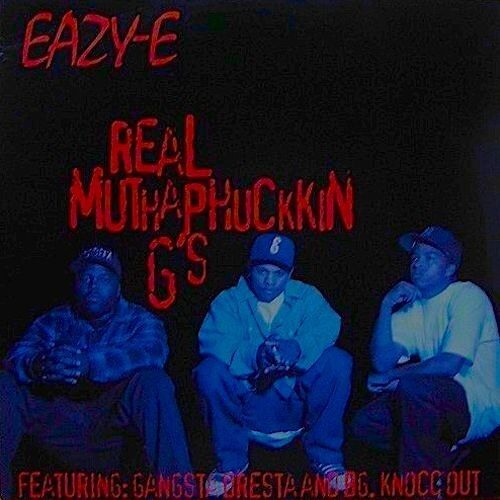 “Real Muthaphuckkin G’s” (alternatively “Real Compton City G’s”) is a 1993 song by Eazy-E from his EP It’s On (Dr. Dre) 187um Killa. It is a diss track directed at former N.W.A bandmate Dr. Dre and his protégé Snoop Doggy Dogg. “Real Muthaphuckkin G’s” peaked at #42 on the U.S. Billboard Hot 100 chart, becoming Eazy-E’s highest charting single as a solo artist. “Real Muthaphuckkin G’s” debuts brothers B.G. Knocc Out and Dresta, protégés of Eazy-E. In 1991, Dr. Dre left N.W.A and formed Death Row with Suge Knight, releasing The Chronic with heavy support from up and coming rapper Snoop Doggy Dogg. With the success of The Chronic Dr. Dre had successfully re-branded himself as a part of the new wave of Gangsta Rappers while simultaneously popularizing a new G-Funk style of production which Dr. Dre had been experimenting with during his tenure with N.W.A. On one of The Chronic’s singles, “F*** Wit Dre Day (And Everybody’s Celebratin’)”, Dr. Dre and Snoop Dogg insulted Eazy-E.
“Real Muthaphuckkin G’s” was Eazy-E’s response to “F*** Wit Dre Day (And Everybody’s Celebratin’)” and the general success of Dr. Dre’s newfound image on The Chronic. Lyrically Eazy-E questioned Dr. Dre’s credibility as a both a Gangsta and as a heterosexual for having worn androgynous clothing and women’s makeup while a member of the World Class Wrecking Cru. On the track Eazy-E also ridiculed Dr. Dre for beating women, likely referencing Dr. Dre’s 1991 assault of Dee Barnes. In the song’s lyrics Eazy-E refers to the 1992 single ‘F*** Wit Dre Day’ as “Eazy’s pay day” as Dr. Dre’s contract allowing him to move from Eazy-E’s Ruthless to Suge Knight’s Death Row Records granted Eazy-E retention of a portion of Dr. Dre’s royalties. Lastly, the track also contained a subtle diss to Death Row CEO Suge Knight a known strongman with a well documented history of criminal intimidation and violence, whom Eazy-E calls Dr. Dre’s “sergeant” and refers to Death Row as a “boot camp”. The music video for “Real Muthaphuckkin G’s” was written and directed by Eazy-E’s longtime Ruthless Records film director Marty Thomas and shot in just two days, entirely in Compton, California. The music video begins with aerial helicopter footage of Compton landmarks, dissolving to a scene picturing lowriders, gangstas, and the metro Blue Line. During the music video Eazy-E raps “all of the sudden Dr. Dre is the G thang; but on his old album covers he was a she-thang”, and an accompanying photograph of Dr. Dre is shown from his tenure with the World Class Wreckin’ Cru. In the photograph Dr. Dre wore a sequined jumpsuit, makeup, and lipstick. Similar pictures of Dr. Dre, borrowed from the covers and inserts of World Class Wrecking Cru discography are shown throughout the video. In the music video that accompanied Dr. Dre’s “F*** Wit Dre Day” an Eazy-E parody character, played by Anthony “A. J.” Johnson, named “Sleazy-E” is featured prominently. In Eazy-E’s “Real Muthaphuckkin G’s” the character returns, only this time he is assaulted and chased by various members of Eazy-E’s posse and is finally shot by the real Eazy-E himself. Knocc Out and Dresta are featured in the song and video and are shown around Compton, joining Eazy-E in assaulting and chasing “Sleazy-E” until he ultimately falls dead beneath a street sign that reads “Leaving Compton”. An alternate ending was also shot showing Sleazy-E dead in the same area where he started in the video. The music video features cameo appearances from Rhythm D, Cold 187um, Dirty Red, Krazy Dee, Steffon, H.W.A., DJ Slip from Compton’s Most Wanted, Young Hoggs, Blood of Abraham, K9 Compton and Tony-A. Does Eazy E's Debut Album Hold Up?